The holidays are full of family time, fun get-togethers, celebrating time-honored family traditions and hopefully plenty of opportunities to create new traditions, too! Today I’m sharing our Christmas tree decorating traditions and 5 Easy Christmas Ornament Crafts to Make with Kids. Thank you to the Christmas Tree Promotion Board for sponsoring this post! One of our family’s favorite traditions centers around the Christmas tree. (Or should I say “trees.”) Every Christmas season we put up two trees; a big tree in the main room for all my non-child friendly ornaments and “fancy” decor and a second smaller “family” tree for the breakfast/sitting area in the kitchen. We cover this smaller tree with multiple strands of twinkling multicolored lights and then let the kids go crazy, decorating their little hearts out with handmade garlands and ornaments. This year, we decided that rather than buy our tree at a local lot, it was time to create a new tradition and make the trip out to the local cut it yourself Christmas tree farm. Even though the weather was a bit on the yucky side, we had a blast on our trip to the Christmas tree farm. The kids were running around, trying to find the perfect tree. And now, we can’t wait to get started decorating our trees!!! If you need a few easy ideas for inspiration to get crafting, here are five easy Christmas craft ideas to get you started. These simple crafts are made with basic crafting supplies you probably already have around the house! 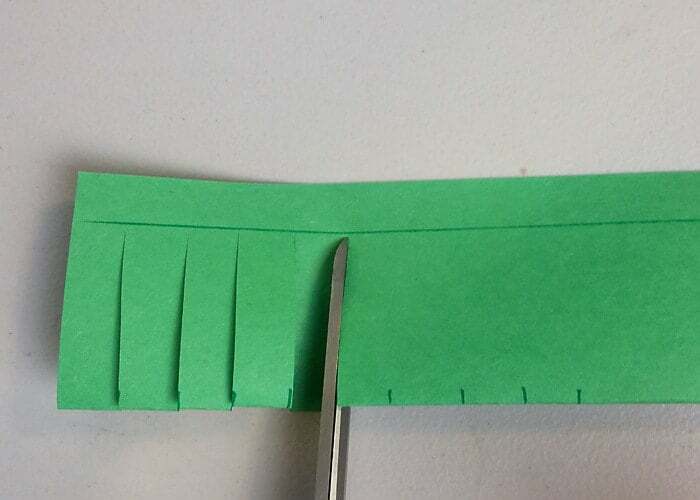 Fold the piece of green construction paper in half, with the 8” side meeting the other 8” side. Using a ruler, draw a line about 1/2” from the edge of the open side (that is, the side that is NOT the fold). Make a mark on the folded side about 1/2 inch apart. Starting at the fold, cut at the mark to the first line drawn. Open your paper and roll it in the opposite direction that it was folded. Overlap the uncut space and hot glue the sides together. Take the tube you’ve just made to form a circle. Glue the ends together, and you’ve got a wreath! Add a bow and some string and it’s ready to hang. Thread needle and make a large enough knot at the end, so the popcorn doesn’t slide off. Push the needle through the middle of the fluffiest pieces and slide all the way to the end. Alternate popcorn and beads if you want to add some color. Knot the end and you’re all set! Cut multiple strips of construction paper 1 inch wide and 10 inches long. 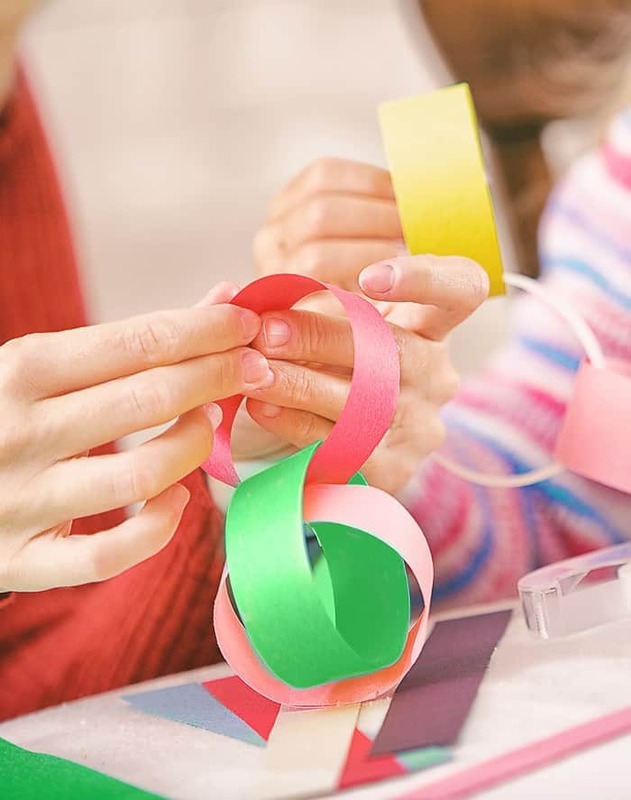 Repeat the process until you have a long chain of construction paper rings. Mix the salt and flour together and gradually add water until soft dough forms. Roll the dough flat and smooth out the surface as well as you can. Have your child make an imprint of her hand in the dough. 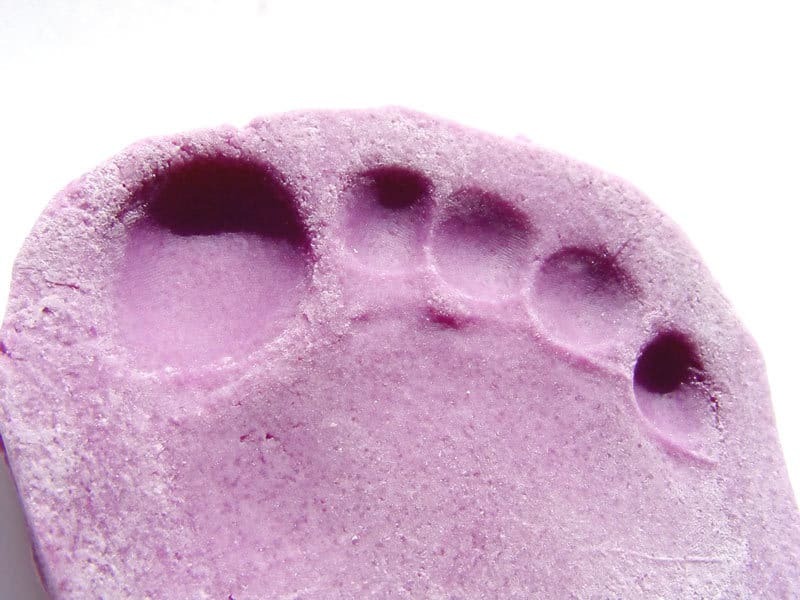 Use a sharp knife to cut around the imprint in whatever shape you want: you can make a heart, a circle, a mitten, etc. Make sure to leave enough dough around the handprint to make a border. Use a straw or pencil to poke a hole through the top (or bottom, depending on which way you want the ornament to hang) and place on an ungreased cookie sheet. Bake at 200 degrees for about an hour, or until hardened. You can either paint the prints or leave them as is, but be sure to mark the year made on the ornament. Tie a ribbon through the hole and hang! Cut the snowman’s “body” out of white paper. Squeeze enough glue on the paper to keep the cotton balls from falling off but not so much that it oozes out everywhere. Stick cotton balls on the body until the paper is covered. Let it dry for a few minutes and then glue the body onto a piece of construction paper. Now it’s your turn? What is your favorite Holiday craft to do with the kids? This is a sponsored post written by me on behalf of Christmas Tree Promotion Board. These are great ideas and perfect for a cold winter day. I remember doing some crafts like these when I was younger. I am so excited for the kids to be done with school this week. I love holiday crafts and just don’t have time during the regular school week. These will be a lot of fun! These are all cute DIY ornament ideas. I am going to make the cotton ball snowman with my niece and nephew with weekend. Such fun and festive ideas for decorating! Your family is adorable! Those are really cute ideas and perfect for kids to make (with a little help for the really young ones. One of my clients gets a real tree every year–it does smell delicious and I know her youngest grandson would love to make some of those ornaments. 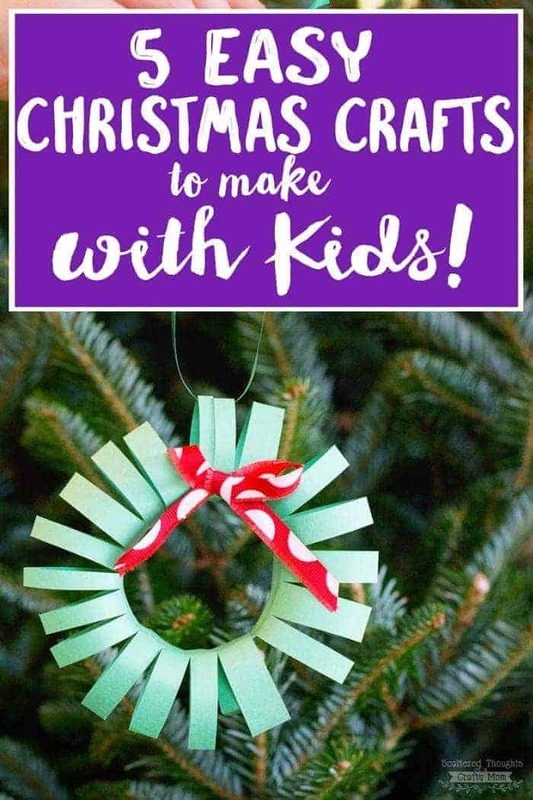 These ornaments are so creative and so easy to make. 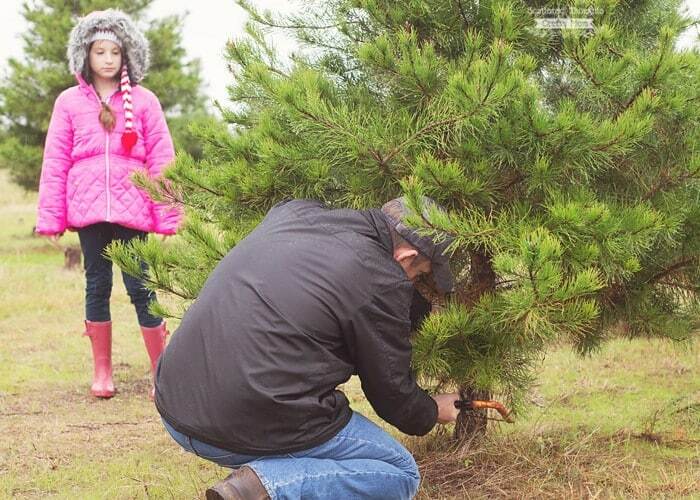 I love the idea of starting family traditions like this one around the holidays. My kids made tree ornaments in elementary school and we hung them on our tree. It’s a great tradition to keep.